John Wayne Airport Parking Your car can pay for your parking space. 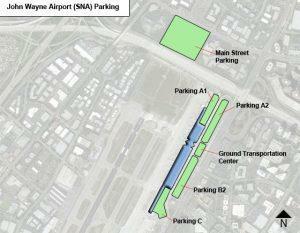 John Wayne Airport Parking : TravelCar is a parking space provider at John Wayne Airport. This firm is the only one in the region offering the cheapest parking packages to drivers checking in to the airport. Our parking lots are readily accessible after making reservations on our website at www.travelcar.com. We are situated offsite, about ten minutes away from the airport terminals. The parking spaces are covered and highly secured. We avail car maintenance services like car detailing and car wash.
We are also situated at seaports in California such as the Port of Oakland; train stations like the Orange Station; downtowns like Irvine and Santa Ana; and hotels around John Wayne Airport. Call us with any questions regarding our services on +1 888-807-0209. 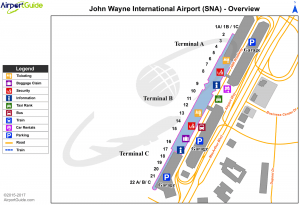 John Wayne Airport (SNA) is based 35 miles South of the City of Los Angeles, State of California, in the United States of America. Orange County owns and manages John Wayne Airport. The airport was reconstructed in the year 1964 and covers 504 acres in Orange County, California. John Wayne Airport has two runways, three passenger terminals conjoined in one building called the Thomas F. Riley Terminal. The passenger terminals have 22 gates in total. John Wayne Airport is number 41 in the list of busy US airports by passenger boarding and the 6th busiest airport in the State of California. John Wayne Airport, previously called Orange County Airport, organized passenger enplanements of 10,423,578 passengers in 2017. Additionally, overall aircraft operations reached 293,649 in number, in the same year. John Wayne Airport is also home to Atlantic Aviation and ACI Jet Fixed Base Operators. Orange County depends heavily on John Wayne Airport for passenger and cargo transport. John Wayne Airport is surrounded by airports like Los Angeles Airport, Hollywood Burbank Airport, Tijuana International Airport, Ontario International Airport, Palm Springs International Airport, San Diego International Airport, Long Beach Airport, and Santa Barbara Municipal Airport. SNA mainly borders the cities of Irvine, Newport, and Costa Mesa. Other nearby cities are listed in the table below. Short-term and long-term parking Parking for Persons with Disabilities Parking spaces are accessible throughout the airport. We have the cheapest parking packages for travelers checking into John Wayne Airport. You can park your vehicle at our covered parking slots at a low price. You can get valet parking for your vehicle and car detailing services at the parking slots. The deals get even better with our ride-sharing service, whereby you can list your vehicle for it to be utilized by other passengers. This makes it even cheaper for you to park your vehicle for extremely long periods of three months. You have the freedom to park for a short time or a long time depending on the duration of your trip or stay at the airport premises. When other travelers are using your vehicle, you as the car owner stand a chance of earning cash based on the mileage your vehicle has covered while in our possession. We have car wash services, interior and exterior car detailing, engine servicing, oil changing, tire servicing, and wheel alignment. The parking lots are fully secured with gates, interior video surveillance and guards manning the place 24/7. You can now grab the cheapest parking packages from TravelCar at various airports, seaports, train stations, hotels and city centers near John Wayne Airport. Our firm is committed to giving travelers the cheapest parking packages in Orange County. We are all about issuing top-notch services at affordable prices. Below is a summary of what you stand to gain when you choose TravelCar as a service provider. Currently, we extend valet parking services to clients in need of parking assistance. It is very pocket-friendly and convenient to our clients. We will take over the parking at the curbside at the airport terminal. You may proceed to security as we take your car to our parking area. Our valet professionals offer luggage assistance. Valet parking is open for all travelers 24/7. Book for valet parking service at www.travelcar.com. Work with a verified and trusted brand to meet your parking goals. With the stiff competition in the market, you may be swamped with ideas or companies from which to enlist services. However, you may want to compare and select the firm that gives you value for your money. TravelCar is undoubtedly the best company in the region. We have a score superior to 9 in Trustpilot and rank top on every other ranking program. We put the high quality of service above everything else. TravelCar ensures that you get top-notch quality from the inquisition stage, the booking process and final parking activity at our parking slots. We have the best team, the most courteous professionals to cater to your parking needs. Reach out to us on the following platforms: Facebook- https://www.facebook.com/TravelerCar/, Twitter- @Travelcar_, LinkedIn- https://www.linkedin.com/company/travelcar/, and Google+- https://plus.google.com/+Travelercar. Our customer support channels are open 24/7, and our staff will be at your service. Road Orange County Transportation Authority Bus OCTA bus operates on Route 76. The bus is only available on weekdays. Road Irvine iShuttle The bus operates on Route A to link John Wayne Airport to Tustin Metrolink Station. The bus terminals are at the front of Terminal B, Lower Level of Arrivals and the curbsides. Irvine iShuttle operates on-peak hours in the morning and evening. Check out the phenomenal statue of John Wayne at the lower level of Arrivals Area. The Lyon Air Museum at the Western side of John Wayne Airport showcases military machinery from World War II. There are plenty of art pieces throughout the airport for the art lovers. For the music lovers, John Wayne Airport has a music performance program to entertain passengers at the airport terminals. The JWA live music program features local artists in Orange County, California. Disneyland is just a short distance away from John Wayne Airport. Other interesting sites you should consider visiting are Knott’s Berry Farm, Disney California Adventure, and Sleeping Beauty Castle. Travelers are advised to make their way to the airport a few hours before their flight departs to avoid getting stuck in traffic. It is also crucial to manage to secure a parking spot on the airport premises. Please note that curbside parking is strictly forbidden at John Wayne Airport. However, do not worry so much about the parking spaces at the airport as you can book online for our parking services. We have the cheapest parking packages around John Wayne Airport. Book on our website, www.travelcar.com to reserve a nice parking space for your automobile.